I love being in the garden at this time of the year as there are many treats to be found. I have been snap happy these last few days finding lots of lovely plants to photograph. Here are a few of the fruity pics. 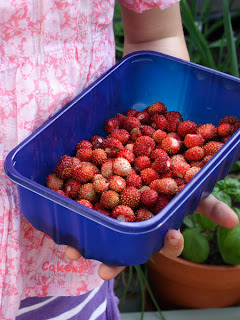 We have alpine strawberries everywhere and my smallest one collected this whole little tubful today. They are very sweet with full flavoured strawberryness. All have been eaten.. well we couldn't possibly waste them could we ? We only had a few but savoured every moment. 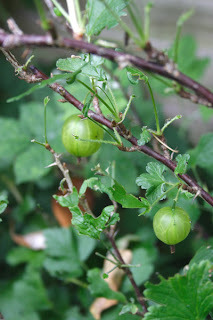 I also have a gooseberry bush, brought for me as a gift for making my sister in laws wedding dress some 8 years ago. The bush is still going strong unlike sadly the marriage which has not lasted. It is a very spiky bush so it's a mama job to pick the berries and not for the small ones. I picked a little punnets worth, just enough to make into a goosberry crumble.. Not quite enough to make jam yet , so maybe i'll get another bush ready for next year. We also have a little morello cherry tree which has lots of, as yet, unripe cherries on it.. just hope we get to them before the birds! It gives me so much pleasure to grow just a few things in our garden to eat and for the family to to have that real connection with our food. I have secretly always wanted to be Barbara from The Good Life and as my husband is getting into the veg gardening this year, i have taken to calling him Tom. We have as yet have no hens, pigs or goats... but maybe one day? ! I am rested thanks to my day in the garden with the girls , so hopefully am all ready for another full on week of sewing. Stock levels are rising thankfully as only a few weeks till Hampton Court now. Those sewing machines are going to be steaming. Mouth-watering pictures! I love this time of year when there is something tasty to harvest. 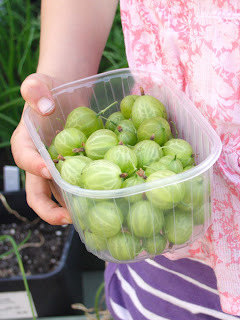 Our fruit is not as far forward as yours though, I tried a gooseberry and it definitely wasn't ripe, I'll leave them a while before trying again! 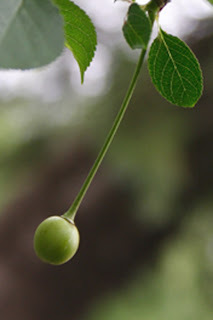 I really like your blog and all the photos of the beautiful things you make. Good luck with the preparations for Hampton Court. We have a large cherry tree, the only decent tree in the garden when we moved here - it carries a great crop of cherries. Most of these are eaten by the blackbirds - it is too large to net - but it is great watching them carefully select a cherry and then fly off to eat it. We end up with lots of seedlings from the discarded stones. Good luck with Hampton Court - CL has cancelled the Scottish Spring Fair next year. Those strawberries look delicious! We were talking about going fruit picking this weekend - but you don't need to. Our blackberry bushes are coming along and our figs, the apples on our trees are slowly being eaten by something!!!! Good luck with Hampton Court! 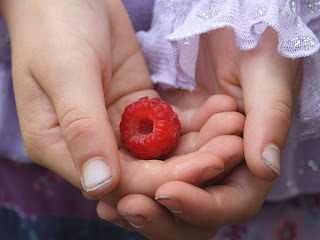 Love all the photos - there's nothing better than picking fruit from the garden! We're embarking on our first proper year of veggie gardening too, I can't wait to ick those fresh peas! Good luck with Hampton Court, I hear it's a wonderful show, might get there one day! So many fruits! 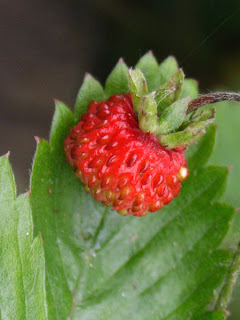 We were so pleased this weekend when our little strawberry plant produced 3 strawberries, but you have loads, yum yum. Good luck with Hampton court, so great. Have just found your fantastic blog! Am about to settle in for a good read! Love those rag dolls! So glad to have found you! Loved the doll and the peg bags. I live in hampshire too! Oh Ginny, the alpine strawberries are making my mouth water - delicious! 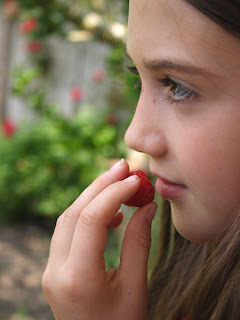 Those strawberries look tasty, I used to have an allotment ( pre children when I had more time!) and loved the strawberry patch and raspberry canes best. I'm sure your lovely work will sell like hot cakes at Hampton Court. Our garden is mostly turned over to food production - and the taste of a homegrown pea, strawberry or courgette is like no other. And despite the hiccups we've been having with our hens, they are worth all of it when you taste one of their eggs. Bliss! Have you tried loganberries? I can highly recommend them for eating and making jam, a few bushes will provide enough for a few pots of jam a year!